I began to love this little baby inside me. And I was sure it was a girl—I even came up with a name. I am 34 years old. I’m originally from Russia and I just got my U.S. citizenship. I am married (it’s my second marriage) and I have a wonderful husband who is originally from Iraq. We have a five-year-old daughter together. I have no other kids. I have never gotten pregnant with my husband without wanting to. It took us almost five months to conceive our daughter. This only happened because I read somewhere that Mucinex thins mucous secretions and allows the embryo to implant easier. Whether it worked or not, I’m not sure, but I finally got pregnant. 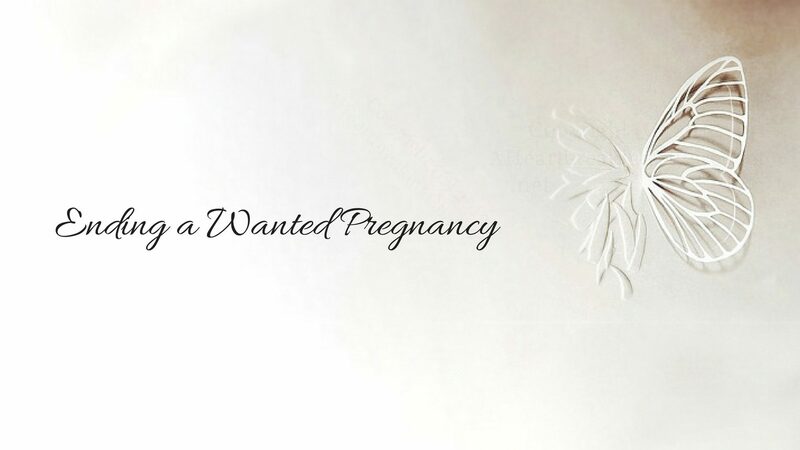 It was a wanted pregnancy. I declined all genetic testing, not really on purpose, just because I didn’t care or believe that anything could be wrong with my kid. My daughter was born healthy. I got pregnant around the middle of May. But I can’t say this was a wanted pregnancy at first. We usually use birth control and this worked for us for a long time. Except we had one night when we didn’t use anything and I got pregnant. I was so mad at my husband that we didn’t really talk for a week and I slept on the couch. It’s not that I hated the baby, it’s just that I was still in pharmacy school. Also, we had no relatives in the U.S. who could help us with the baby. The workload that I had in school was enormous and it seemed impossible to go to pharmacy school and have another baby. I finished my day of pharmacy school rotations and was driving home. Over the phone, my mom convinced me to do a pregnancy test. So I bought a test from Wegman’s drugstore. Sure enough, it was positive. I will not describe the fight that I had with my husband that night—I was really mad. Finishing pharmacy school and having a baby was impossible. As time progressed with my pregnancy, I changed my mind about the baby. I believed that God knows the right timing and that this baby was meant to happen for some reason. I began to love this little baby inside me. And I was sure it was a girl—I even came up with a name. My first ultrasound was fine, no problems. At my first prenatal appointment, the nurse suggested we did genetic testing, a test called cell-free DNA screening. The nurse said because I would be 35 at the time of delivery insurance would cover it. I said why not, especially since I didn’t have to pay for it. During the appointment with the genetic counselor, they went into the possibility of doing a CVS and amnio. I kept thinking, “Why are we even talking about all this?” My husband has no history of birth defects in his extensive Middle Eastern family. My family is also fine. I decided to get the test done anyway. The genetic counselor promised to call in seven to ten days. I usually worry about any medical test—I almost worried myself into insanity when I had to have a skin biopsy earlier that spring. The worry almost caused me to fail school. But this time I was fine—I didn’t even think about the test. I went with my daughter to New York City to visit my close friend. My husband stayed home. While I was driving around the city with my friend on a Friday I got the call. The genetic counselor asked if I had a minute to talk. I did. She said that the results came back with a 72.5% chance of having a baby with T21. It was as if the whole world ended for me. The amount of crying I did that day and the week following was enough for my whole life. I refused further testing. After all, the cell-free DNA screening is 99% accurate. Why torture myself with more waiting? They booked me for a D&C that next Tuesday. My husband came and picked me up from New York City. He didn’t talk much about it. He was blaming me for not wanting to get pregnant in the first place. And I cried and cried knowing that I loved this baby inside me, but I simply couldn’t keep a baby with Downs. The procedure was fine although my hormones went insane after it. I cried and cried afterward, feeling like a killer. I kept thinking about my little girl every time I saw other moms with their babies. Two and a half weeks have gone by—I am better now, I guess. It’s summer break at school so to keep busy I’m working out to death. Last week I started to bleed every time I exercised so I would stop and then push myself again the next day. It’s the only thing keeping me sane. I wanted to go overseas to visit my husband’s relatives and change things up a bit, but we’re experiencing monetary problems, so I’ve stayed. This week my husband started to talk about another baby. I’m freaking out—where is the guarantee that this genetic problem won’t happen again? I simply cannot go through all of this again! I don’t know what to say to my husband but I’m not brave enough to try again. At least not now, maybe next year?